In the late 1800s, doctors didn’t know much about treating cancer. It was thought of as incurable and contagious, so many hospitals refused to treat it, and wealthy patients often had to ship out to Europe for care. At the time, European doctors had developed more advanced forms of cancer treatment. An American doctor, J. Marion Sims, trained in Europe during the Civil War and returned to New York to work at the Women’s Hospital, which refused to treat women with cancer. 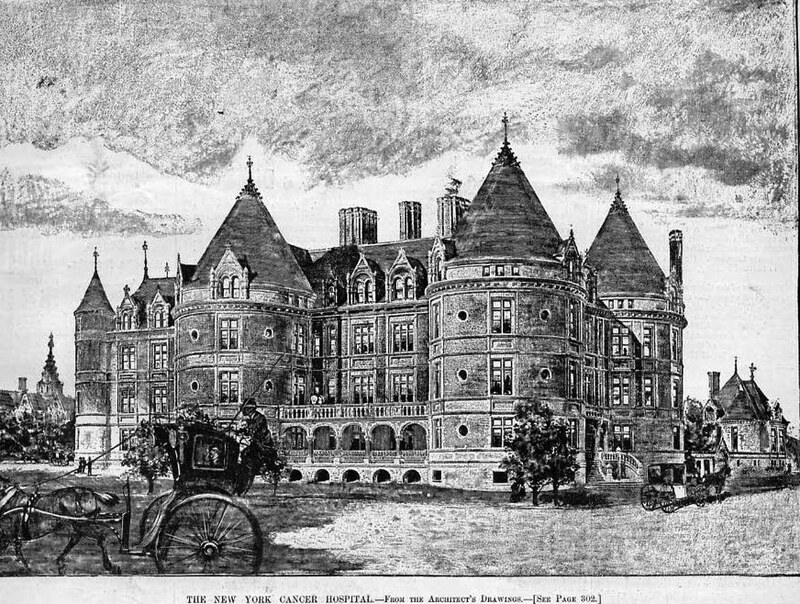 So Sims teamed up with many prominent New York investors, including John Jacob Astor III, to start a hospital specifically for cancer treatment. 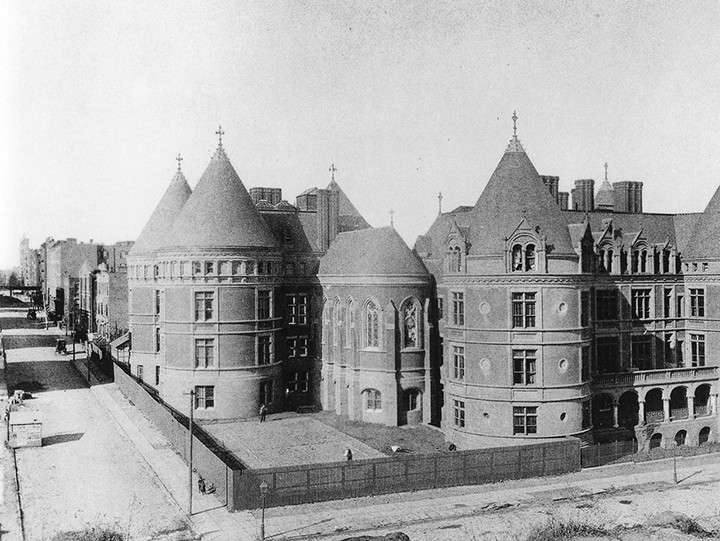 They brought on the architect Charles C. Haight to design a French Renaissance-style hospital. 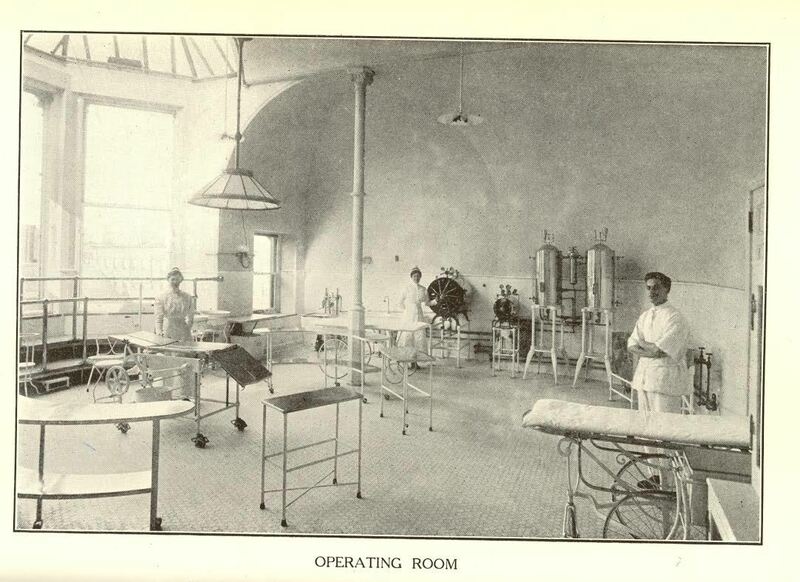 At the time, many hospitals were being built like aristocratic mansions in an attempt to lure wealthy, paying patients. (Typically the wealthy received home care in the 1800s.) So the elaborate, graceful structure was built to make patients feel like they were taking a visit to the French countryside rather than a place of cancer treatment experimentation. To further encourage patients, the hospital even held champagne parties, carriage rides through Central Park and hired excellent chefs. The food was so good, in fact, that New Yorkers would come to the hospital’s dining room to celebrate events like birthdays. The striking design of the building was very carefully thought out. 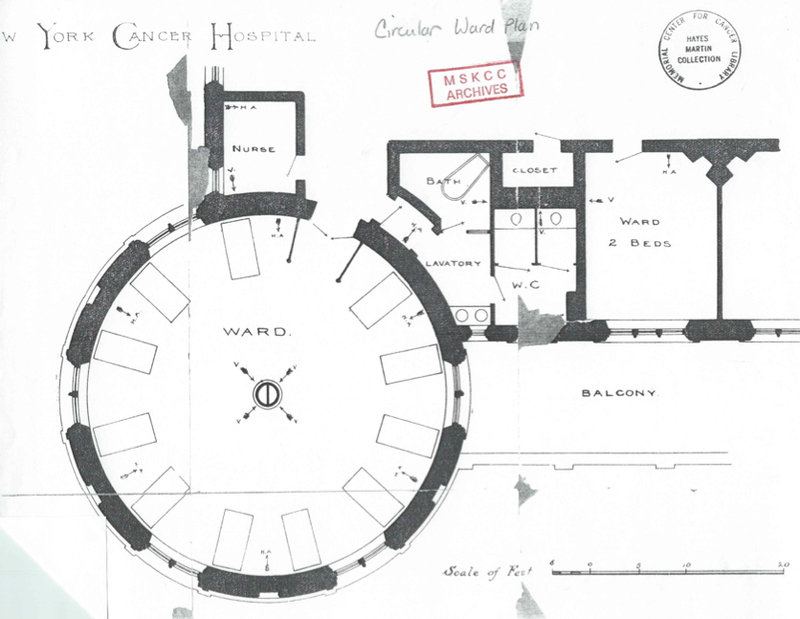 The five turrets, which housed patient wards, were to be circular so that dirt and germs would not accumulate in any corners. It also allowed nurses to move easily from bed to bed. Plenty of windows brought in fresh air and sunlight. The hospital also included an amphitheater where doctors could perform surgeries and surrounding students would be able to watch and learn procedures. Few people wanted to go to the New York Cancer Hospital, and it struggled financially. Eventually, in 1939, the hospital left 455 Central Park West for the Upper East Side at a time when surgery was getting better. Its new incarnation, Memorial Sloan Kettering, has become one of the best hospitals for cancer treatment in the country. The move marked the beginning of the building’s second life as the Towers Nursing Home. This institution too became notorious for unfortunate reasons. Patients were mistreated with claims of inadequate heat, pest infestations, physical abuse and negligence. The building was also falling into disrepair, with a reportedly “pungent odor” dominating the place. After a state and federal investigation, the nursing home closed its doors in 1974. 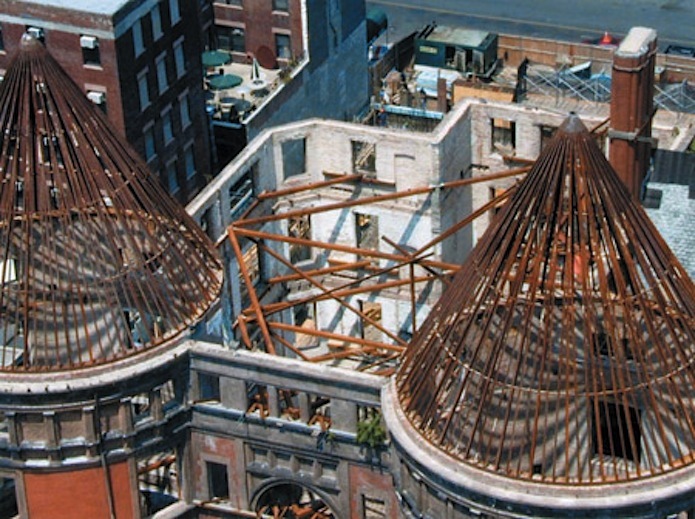 Facing potential demolition, the Landmarks Preservation Commission declared the then-empty building a landmark in 1976. Still, the project forged ahead–a restoration of the hospital building alongside the addition of a new 26-story tower adjacent to the landmark. While the exterior walls of the former hospital were largely retained, the interior was gutted. The project architect RKT&B found that after years of rot most everything needed to be replaced, including the roof structure, the roofing slate, the windows, the flooring and the stairs. 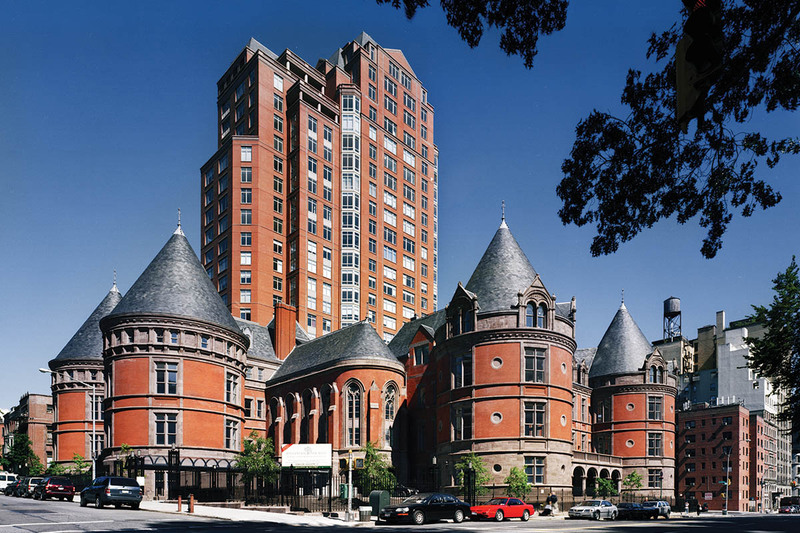 The roof was replaced with new slate roofing that matched the original in size and color, and all four of the masonry chimneys were disassembled and rebuilt. 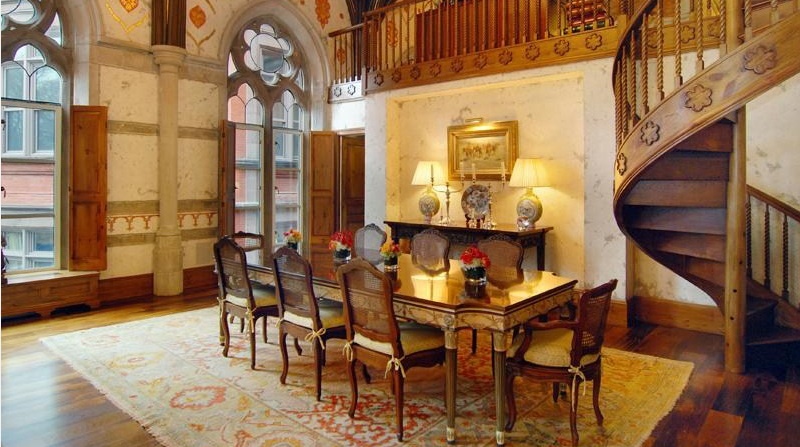 Inside, the space within the massive round turrets was transformed into living/dining rooms and master-bedroom suites. 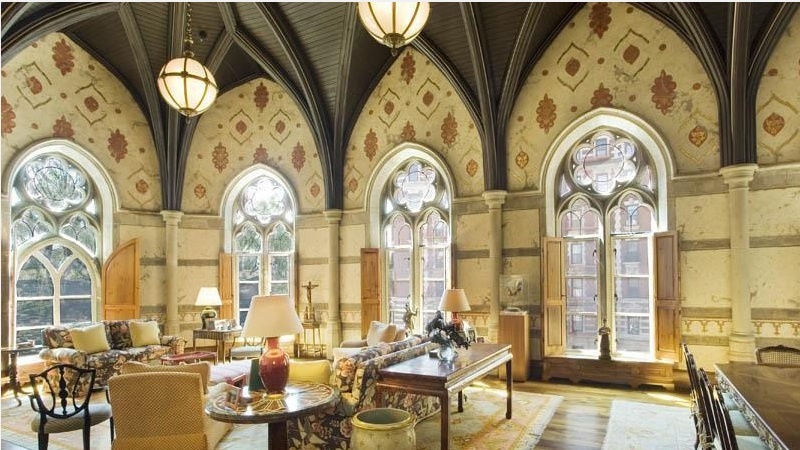 Apartments on the top floors feature turret spaces with 40-foot cathedral ceilings. The building’s former chapel amazingly still had some details intact. 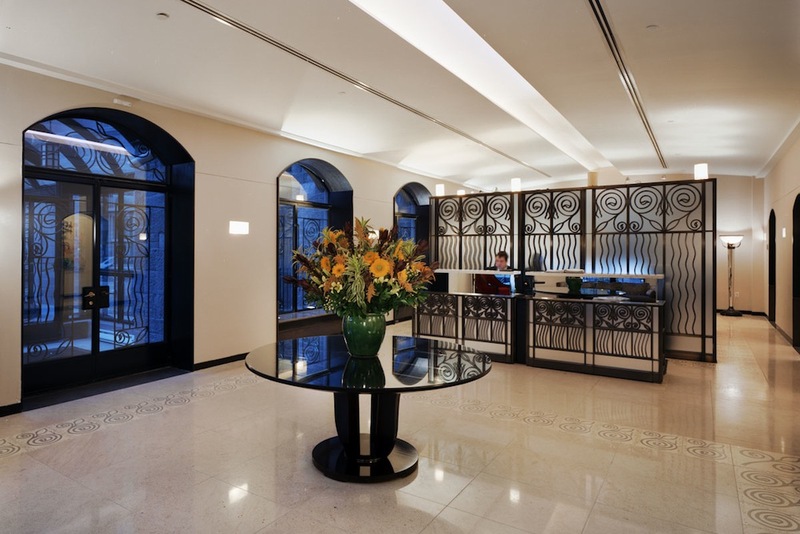 Although features like the mosaic-tile flooring, iron railings and stone detailing were mostly gone, RKT&B was able to preserve column details and the wood ceiling in its entirety. The stunning last unit sold in 2012 for $8 million. The reno lasted until 2005, when the hospital complex and tower opened with multi-million-dollar apartments, a spa, indoor pool, and 24-hour concierge service. The exterior is now distinguished by a drive-up entry courtyard and intimate interior garden, unique for New York City apartment complexes. The scope of the transformation was, in a word, incredible. That the building made it from its “Bastille” days to luxury condos is one of those New York stories that’s hard to shake. The next time you find yourself on the corner of 105th and Central Park West, be sure to give the ghosts of this building’s past a nod, and appreciate that their home still stands majestically along the park.